This is a review of a most amazing book called ‘Uttermost Part of the Earth: a history of Tierra del Fuego and the Fuegians’ (1948) by E. Lucas Bridges. I have been studying hunter-gatherers as part of my MSc, but I came upon this book by chance a year ago. As a breather from my studies I became determined to read something different and wonderful and so began to google ‘the greatest book ever written’. Uttermost Part of the Earth kept coming up, and ironically, it was about hunter-gatherers. No escape from the hunter-gatherers for me! I just had to buy and read this wonderful book after reading the reviews. But, being me, it ended up on my bookcase for a year and I finally opened it up 2 weeks ago. I’ve been reading it avidly since. It actually is the greatest book ever written, there had been no exaggerating. The subject matter of the book is especially appropriate for The Daily Beagle, because it was the Beagle, captained by Robert Fitzroy, that first discovered the region and the Yamana people in around 1830. 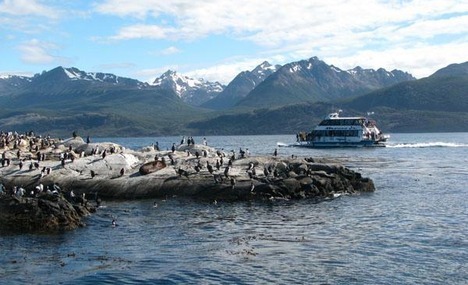 Not only that, but Charles Darwin is part of this story of discovery and adventure, and the region of activity exists along a strait named ‘the Beagle Channel’. So where is Tierra del Fuego? This is the southern-most tip of South America, just above the notorious seas of Cape Horn. The climate is extremely cold, with temperatures able to reach -20 C in winter. The terrain is rugged, of jagged mountains, glaciers and rocky outcrops emerging from a maze of sea channels. Ecologically, it is steppe and open forest/shrub, with herds of deer, visited regularly by penguins, whales and other sea mammals. In 1826, the Beagle was commissioned to chart the Southern Oceans and explore the unmapped Southern most regions of the Americas and eventually located Tierra del Fuego. On finding a wide channel into the region, they named that Beagle Channel, and along this encountered a human community who called themselves the Yamana. These people were canoe people, living mainly on the water, and Fitzroy was concerned by what he saw as a most wretched and unhappy existence. In spite of the cold, these people were almost completely naked and lived in the most basic stick dwellings and wind-shelters. Married women swam naked in the freezing waters to moor the canoes and Fitzroy was shocked for them and their apparent sorrows. However, they were not friendly, but fearful and suspicious, and possibly could become aggressive. Fitzroy somehow captured four of their young people to take back to England. His plan was to ‘civilise’ them and return them to their community later, so they could calm their people and make them open to accepting help. These young people were named by the crew of the Beagle as Boat Memory, Fuegia Basket, York Minster and Jimmy Button. Boat Memory died on the passage of an infection, but the others survived and were educated, clothed, taught table manners and once in England were presented at the Royal Court where everyone was charmed by them. During the passage they were asked about the Yamana, and seem to have made sport with their captors, telling dramatic tales of cannibalism that were later found to be completely false. In time, it was decided to return the young people to their community, and so they reboarded the Beagle, with Charles Darwin and some missionaries, returning to Tierra del Fuego. On arrival, the three Yamanas returned almost immediately to their original way of life. 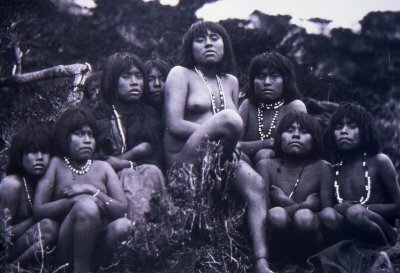 A missionary camp was established on Ushuaia, but tragedy struck as the Yamanas promptly assassinated the missionaries and took their belongings . They were more hostile than expected, though Jimmy Button had tried to prevent the tragedy. In time, a second missionary post was established at Ushuaia, but again, the missionaries were promptly slaughtered, this time with Jimmy Button himself being found guilty of leading the killing. All amicable relations with the Yamana had been lost, and the Yamana made very clear that they found their own lifeways to be completely acceptable to themselves and not wretched at all. They wished to be left alone. Another missionary post had been established on the Falkland Islands at this time, to assist with the conversion of the Yamanas. On this island, of missionary parents, was born the author’s father, Thomas Bridges. Now a personal perspective. If there is one thing I absolutely do not like, it is missionaries. Never has so much damage been done to human-kind than that which was done by missionaries, and scarily, Evangelists are still trying to send missionaries to convert (i.e. destroy) uncontacted tribes today. Missionaries killed thousands by infecting them with viruses, by demanding they wear clothes in humid climates (which gave people pneumonia) and by destroying thousands of years of unique human cultural heritage and replacing it with Christianity. Honestly, I get angry writing about it. I think Evangelists who have set off today to convert uncontacted people should be locked up instead. I love this book, but the Bridges were missionaries, who arrived in Tierra del Fuego funded by churches, to make Christians of these unfortunate Yamanas, who are now culturally extinct. They didn’t even have the grace to call them Yamanas, but called them Yaghans instead which was a word from their language that referred to the rugged landscape. When Thomas Bridges was 18 years old, the missionaries abandoned their mission of converting the aggressive Yamana people and left the relative safety of the Falklands for England, but Thomas Bridges remained, alone, to make his fortune here, on Keppel Island. He was determined to convert the Yamamas and for this, he decided he must learn their language and meet them on their own terms. This plan went well. In a few years he was fluent in Yamana and sometime later able to establish a first settlement on Ushuaia, on the Beagle Channel. Some Yamanas, who he called Yaghans, had befriended him enough to join him and learn the basics of agriculture, while appeasing nearby Yamanas. This went so well that he returned to England for a wife, who he brought first to the Falklands, where she delivered 2 children, and then to Ushuaia where she had four more babies, including the author. The author was therefore raised, quite wild and free, in friendship with the Yamamas, at Ushuaia, speaking their language, hunting and playing with his siblings. His father was an enthusiastic mariner with no fear of the wild seas of the cape, often setting sail against the advice of the more experienced Yamana mariners. On one occasion when he took his son with him, they almost drowned in the wild winter seas of a rocky channel, in search of an uncontacted mountain community called the Ona. Their ship became stranded in the rocks by the rocky seas and began to disintegrate over a period of a week. In desperation, his father forced the collapsing ship to attempt sail towards a rocky beach, a suicide mission, and as they neared the beach lifted his son and threw him bodily from the ship and onto the rocks. 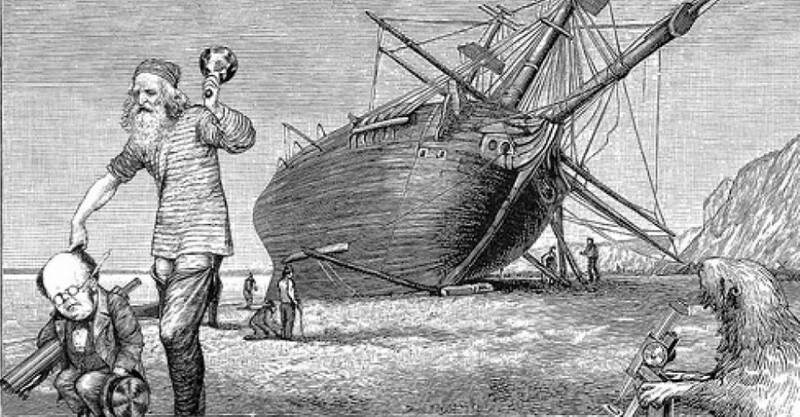 The ship collapsed and his father then swung from the falling mast like Tarzan onto the beach himself, where he suffered a lifelong back injury. They then had to survive huddled without shelter on the wintry beach, hunting fish like natives until they were rescued. His father’s next adventure was to try and climb the mountains instead with two Yamama companions to reach the Ona, and not bring his son this time. The author describes his sorrow at seeing his father disappear into the woodlands without him. But he returned a week later, defeated by the harsh conditions, which was lucky, because if he had reached the Ona, they would most certainly have killed him immediately. 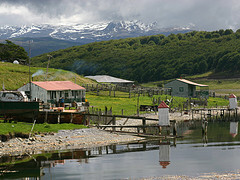 The population at Ushuaia rose as more Christians arrived, including families, and it was decided to establish a more permanent village nearby, named Estancia Harberton, in 1886, which still stands now, managed by Thomas Bridges great-grandson. Another factor in the establishment of Harberton was that Argentina had acquired Tierra del Fuego. The bridges family were granted permission to farm the region around Harberton and granted Argentinian citizenship. This Argentinian presence at Tierra del Fuego was to prove ultimately tragic for the indigenous Yamana and Ona people. The arrival of sheep farmers brought violence to them, and many were killed by such farmers. In addition, waves of deadly measles epidemics hit the Tierra del Fuegians and by the 1930s, their culture was extinct. E. Lucas Bridges provides in his brilliantly written book our most valuable resource on the lost heritage of the Yamana. He describes their hunting methods, their fishing techniques, their canoes, their dwellings, their plant foods and their traditions. He also brings great humanity to his story, because he does not have an imperialistic or superior view on the Fuegians. Most texts from this time are blighted by social Darwinism (the idea that hunter-gatherers were less evolved than Europeans). This text is not and while reading it you are there in Tierra del Fuego with him and his family and your sympathies are with the Yamana people and the loss of their traditional lifeways. To E. Lucas Bridges, their pre-missionary life was not wretched at all, but ingenious and effective. These peoples are lost now. 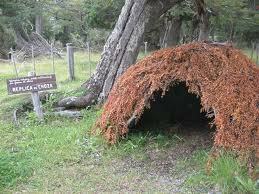 Their canoes and huts, their traditions and their strategies have all vanished from the shores of Tierra del Fuego. It seems they never did make a choice to become westernised, they maintained a dignity and determination in pursuing their traditional ways, but they welcomed the chance to acquire new foods and better tools. The most we can learn from this is that culture is worthy of preservation and that living heritage is precious, but also we learn in this book what it is to be human. I am going to read this. I vaguely remember something about the story of the children. This was popular – taking people to study and display – depressing. You have to admire a culture that can survive such harsh conditions. South American authors have been high on my reading list for the past year – this will be a little different. Thanks, the book is amazing, I can’t recommend it enough. All the records show that the children were very happy, but I can’t believe they really were. No-one even knows how they were captured. Fitzroy said they were exchanged by the Yamanas for buttons, but the author said that no Yamana would ever do such a thing. Great story, I will check the book!! !